Toulouse White Painted 3 Over 4 Chest of Drawers. Shopping for bedroom furniture can sometimes be a mundane task with a vast amount of choice. Look no further…we’re here to make it easier for you with the Toulouse White Painted 3 Over 4 Chest of Drawers. 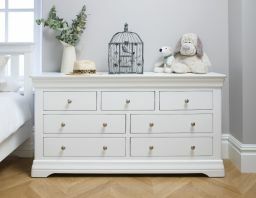 There are a number of reasons why we are confident this white painted chest of drawers will tick all the boxes. Many customers purchase these for use in living rooms or hallways in a similar way to a large sideboard for a great looking storage solution. 2. Has 7 spacious drawers, with the three smaller ones been 38cm wide, 28.5cm deep & 12cm tall & the four larger drawers been 60.5cm wide, 28.5cm deep & 12cm tall. Overall Dimensions – The chest is 151cm wide, 43.5cm deep and 77cm tall. Lovely, solid chest. Communication for delivery was excellent, delivery men were great, very helpful. It was just has I expected and hoped for, good service all round, will use you again when looking for furniture. I am very pleased with my purchase of a chest of drawers. The item is lovely and good quality. And the service was excellent from placing the order to the delivery. Beautiful large chest of drawers. Fine finish. Bought with wardrobe. 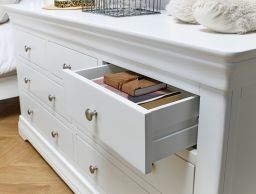 The three smaller drawers and four larger ones are quite deep and open and close with ease and are very spacious. The company are very professional. Even when viewing items, someone was online to answer any questions we had. Free delivery and we live in Liverpool. Arrived very well packaged and in excellent condition within the agreed 14 days. We were notified of delivery time and date. Driver arrived 10 minutes early. Great! Highly recommend if you are looking for beautiful bedroom furniture. Excellent quality for money. I am delighted with my new chest of drawers. They were delivered at exactly the time stated and they look great in my bedroom. Absolutely beautiful - well made and delivered on time. Has added to our room!